Another flagship of Huawei is on its way named as Huawei Honor (Glory)Note 10. The Chinese company announced that Honor Note 10 will be launch on 31st July in Beijing. As per reports it is going to launch 0n 30 Aug globally. The Honor Note 10 is the successor to Honor Note 8 which was launched in 2016. Honor Note 10 sports for 6.9 inch big Super AMOLED display with 2K resolution with 6000mAh massive battery. This Phablet will run on Android 8.1 (Huawei EMUI 8.1). The device has a HiSilicon Kirin 970 processor which is owned by company itself. Honor Note 10 will be coming with 6/8 GB RAM and 64/128/256/512 GB internal memory. It sports Hybrid dual SIM, 2G, 3G, 4G, LTE, Wi-Fi 802.11, Bluetooth 4.2, USB Type-C port, NFC, Fast charging, FM, 3.5mm Jack. The build quality of this Phablet is significant with metal body. The Phablet also sports for dual rear camera 24MP + 16MP with dual tone flash and 16 MP front camera for selfie and video. The device has Corning Gorilla Glass for screen protection and fingerprint unlock. Slide lock, device pattern lock, PIN code lock for device security. The other features like accelerometer, ambient light, compass, gyro and proximity sensor. Honor Note 10 is likely to come in Blue, Black, Gold and Silver colors. The price is 468$. Will Honor Note 10 touch the sky with Glory tag? What you expect from this device? Let us know. 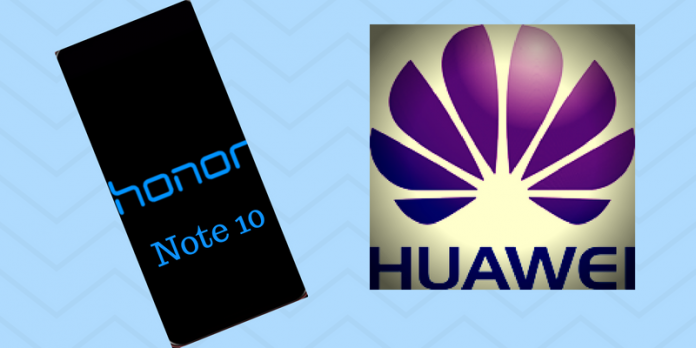 To get more updates on Huawei Honor Note 10, stay tuned with us.